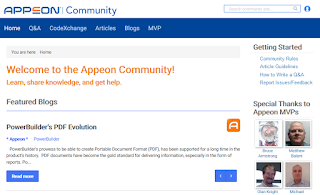 Great White North Technical Evangelist: All New Appeon Community Website! Appeon today unveiled their latest Appeon Community Website update that completely redefines the customer experience for the InfoMaker, PowerBuilder and PowerServer Web & Mobile products. The new site also integrates the CodeXchange database that includes a plethora of source code for products like PowerBuilder and PowerServer. The database will be fully populated over the next few weeks from its home under the main Appeon website. This also marks the first time that CodeXchange will be open to new submissions as well since being taken over from Sybase. Appeon has also introduced a new Blog area to the site where Appeon and community leaders will be posting leading articles around industry trends and its various products. The new website has the previous Q&A and Articles areas as well so that the Appeon customers can get the latest information about product techniques and approaches as well as ask, get answers and follow hot topic discussions. The Community Website has also included information on upcoming Webinars and Resources (for example: Appeon University and Product Manuals). 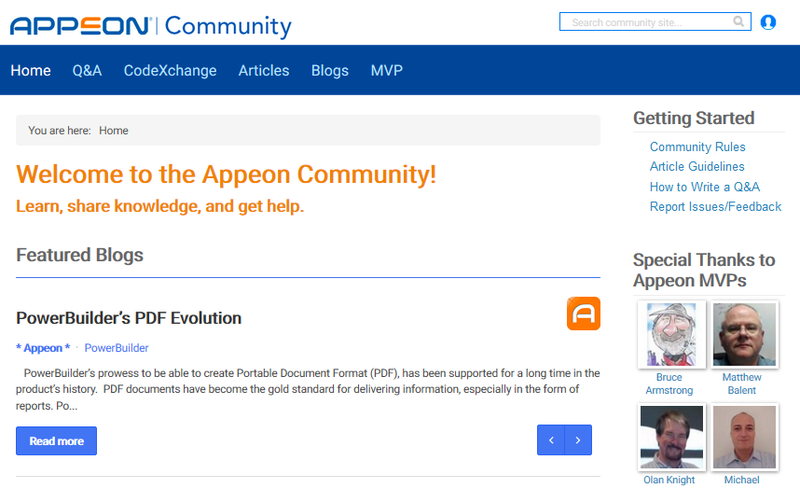 Note that the Appeon Community website is free for anyone - not only just active Appeon product users. Just create a free account to experience all that the new website has to offer!